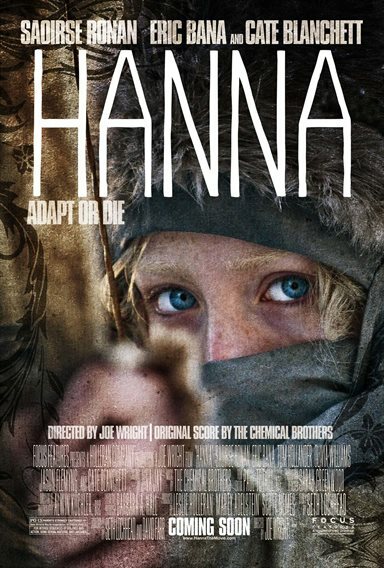 Download Hanna in Digital HD from the iTunes store. Hanna images are © Focus Features. All Rights Reserved. 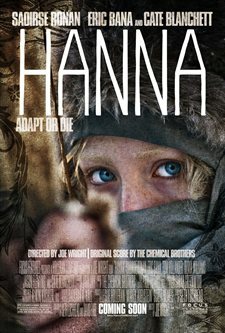 Hanna, directed by Joe Wright tells the tale of a teenage girl utilizing her unique skills to battle against a malicious government agency. The film opens in the snowy mountains of Finland where a young girl, Hanna played by Saoirse Ronan, is being raised by her father Erik (Eric Bana). Since birth his teachings and their way of life is all that she has ever known. Her father has raised her using the skills he learned during his time as a spy such as fighting, and hunting. The only other source of schooling she has received is from the encyclopedia's her father owns as well old fairy tales. This is the only information she has of the world around her having had no other friends her entire life. Eventually the time comes when her father must return to the outside world. He informs Hanna that it is up to her to return to the outside world and engage the agency that he once worked for. She signals the agency through a device her father has kept over the years. They send operatives to capture her and she allows this to happen so she can get close to the operations leader, Marissa (Cate Blanchet). When Hanna's plan fails she escapes the facility she is being held in and uses her skills to hide out in the surrounding area. As she makes her way out into the world she learns that everything her father taught her wasn't all there is to know. She befriends another child and together they learn from one another. Learning about her own humanity isn't the only lesson that Hanna learns along the way, there is a darker secret that has been kept from her and it could easily shake her fragile hold on sanity. The director knows how to keep the action of the movie well timed without losing the audience's attention. This works well because it is the somewhat weak script that could just as easily lose the audience. Thankfully the actors know how to make the most out of simple dialogue and equally simple plot. On a base level this film is essentially one long video game and not one that you get to play. It is an action movie that knows all the tricks of the trade and utilizes them to keep the audience entertained throughout the whole film. What makes Hanna work well is also what makes it fail, the most you can expect from it is an enjoyable thrill ride with a tale of suspense and espionage thrown in. But that is where it ends, given any deep thought you would begin to see the obvious holes in the plot and if that happened while you were watching it then the film would lose all of its momentum. Hanna is another film in a line of films that lead up to the summer when we get our big blockbusters. It is enough to fill us and at the same time whet our appetites for what's to come. But it can never truly fill us and that is where it falls short. So if you're looking for a simple film then Hanna is certainly worth the price of admission, but don't expect too much more than that.